There’s actually a small Easter egg in this comic about Easter eggs! 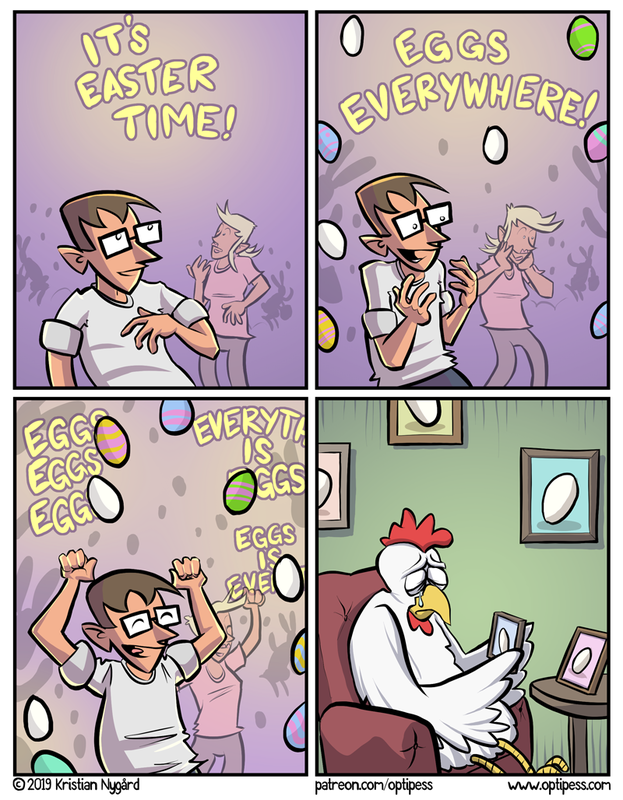 One of the eggs in this comic was actually also in the previous Easter comic I did. Incredible! Edit: Glad to see so many still using RSS! In an attempt to (again!) fix the missing image in the feed I’ve now done a change to my WordPress theme – which I know next to nothing about – so here’s hoping it works! If you’re reading this because my feed exploded somehow, please let me know! Personally, I read comics through my rss reader by clicking through to the websites (even when the comic loads in the reader). Happens 0 to 7 days after a comic goes live. In this case, right on schedule! Perfect way for me to track all the updates. Another RSS user here, checking in. The RSS feed I use only gave the text post. Incidentally I always clichthrough to the website. I also get updates through RSS, but click to the website because the reader doesn’t display the image. Another one here… There is no way I could follow the ~150 webcomics without my beloved RSS. RSS in feed.ly is how I keep myself updated on all the webcomics I follow, including this one. I have to admit, I didn’t encounter your comic on social media yet. I am a curmudgeonly old-folk type person who refuses to learn how RSS works, or what it stands for. I use a comic tracking and listing site called Piperka to catch up on Optipess every time it has three new updates waiting. I am currently subscribed to 1444 comics. RSS all the way! Best thing I found out a decade ago! I’m one of these remaining webcomic readers who still check sites on update day. Even if it’s not an update day. Instead of following tens or hundreds of webcomics, I follow about 5-6. If I get bored or some webcomic is too much time-consuming, I find another, binge my way through whole archive a then add it to my top list. I check websites on update days (or periodically for those that update irregularly). I use a plugin to track it all. I know, I’m a Luddite. I’m another luddite who checks the website, no RSS for me. I’ll keep checking, and just rejoice when you return! Have a nice time off.